The Indigo Platinum MasterCard is a pretty basic credit building card, offering a standard APR and credit limit with no rewards program. Unless you qualify for a lower annual fee, it’s probably not worth what it costs to own. If you are trying to improve your less than perfect credit, the Indigo Platinum MasterCard has a pretty standard APR and credit limit. But the wide range of annual fees and unspecified policy for increasing your credit limit over time rank this card on the lower end of credit building cards. In general, the additional fees aren’t too bad for an unsecured card. You won’t have to pay a set-up or monthly servicing fee. There is no rewards program though, so if you qualify for the highest annual fee the cost of membership is much higher than typical. 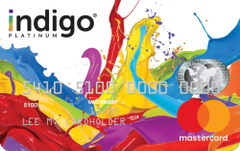 The Indigo Platinum MasterCard is specifically designed for people with less than perfect credit, and it is even available to those with a previous bankruptcy. If you are still worried about qualifying, you can check for pre-qualification on their website in just a couple minutes with no impact to your credit score. If you have bad to fair credit and are eager to improve it, this card is a quick and easy way to get started. Unlike many cards available to those with bad to fair credit, the Indigo Platinum card does not require any sort of security deposit. Everyone who is approved for this card will receive a standard credit limit of $225-$300, depending on your annual fee. The Indigo Platinum card is a good option if you don’t have the funds to put down a large deposit, but want a standard credit limit right away. When it comes to steadily increasing your credit limit, the Indigo Platinum card leaves much to be desired. The initial credit limit of $300 is standard for a credit building card, but is still pretty low when it comes to boosting your credit score. Plus, the Indigo Platinum card does not specify any timeline for an account review to increase your credit limit. So while you’ll get the average credit limit right away without a deposit, you might find your progress inhibited a few months down the line when you can’t improve your available credit. The Indigo Platinum card APR is also nothing special, at 23.9 percent. You’ll find plenty of credit building options with a lower APR, such as the Wells Fargo Secured Credit Card or USAA® Secured Visa Platinum® Card. But many unsecured cards have APRs upwards of 24 percent, so this is a middle of the road option. You definitely won’t want to carry a balance in order to avoid accumulating interest charges. The cash advance fee, late or returned payment fee and minimum interest charge are also pretty standard on this card. They aren’t particularly high, but you’ll still want to avoid them whenever possible. After applying for the Indigo Platinum MasterCard, you’ll be assigned one of three possible annual fees based on your creditworthiness. You’ll get either $0, $59 or $99 ($75 the first year). It is impossible to know which fee you’ll be assigned before applying, and both the middle and top tier options are much higher than average. Since this card offers no rewards to offset this cost and only average APR and additional fees, paying any sort of annual fee on this card doesn’t seem justified. If you are lucky enough to snag the $0 fee, it is a decent credit building option. The Indigo Platinum MasterCard does not include any sort of rewards scheme. You will get a few extra benefits, including extended warranty and roadside assistance, but the perks on this card are nothing special. Why get the Indigo Platinum Mastercard? You have bad to fair credit and/or a previous bankruptcy and need a card with good approval odds. You can qualify for the $0 annual fee. You don’t have the money to put down a large security deposit but still want a standard initial credit limit. Make regular charges and on-time payments to start improving your credit score. Pay your monthly balance in full whenever possible to avoid racking up interest charges. Take advantage of perks such as roadside assistance and extended warranty.